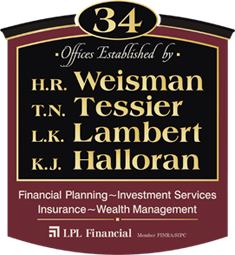 The idea of combining the offices of a few carefully-selected and highly-motivated, independent advisors began in 1949 with H. Robert Weisman. From a one man shop specializing mostly in insurance, our office has developed into a comprehensive financial services team with extensive knowledge in the areas of investments, retirement planning, and insurance (including health and long-term care) as well as assistance with estate planning for families, businesses and retirees in the Nashua, NH area and beyond. Our associates are registered to recommend mutual funds, ETFs, individual stocks and bonds through LPL Financial and are licensed in the areas of life and health insurance, as well as annuities. Please explore this website to learn more about our offices and our team. We hope you find this site interesting, inviting and valuable. Thanks for the virtual visit, and please get in touch …we’d love a real-life meeting! It all starts with trust. Our most important goal is to understand your needs so we can fulfill them. Our strongest relationships have lasted since our firm was founded and that level of trust has given our clientele great confidence. Our Firm encourages an honest dialogue between client and advisor to help meet expectations. No matter your current fiscal position, we will get you where you want to go. At its best, working with our advisors becomes a hands-on experience. We relish the opportunity to track your portfolio progress and fine-tune plans along the way.